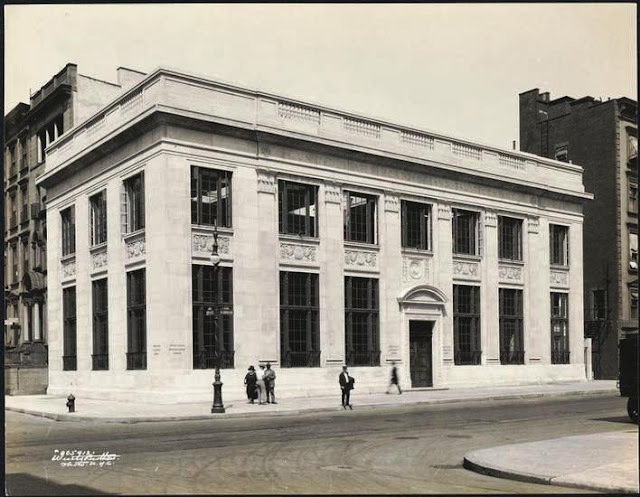 In the spring of 1921 the United States Mortgage and Trust Company was doing a brisk business at its Madison Avenue Branch. The five-story building included rental apartments on the upper floors. Business was so brisk, as a matter of fact, that the old building was proving inadequate. A new structure “was decided upon in order to meet the requirements of the rapidly increasing clientele of this office,” reported The New York Times in May that year. Prior to the announcement the firm had purchased the properties at Nos. 27 and 29 East 74th Street which abutted the existing branch building. Now, in May, it sold that structure and announced plans to erect a new branch, predicted by The Times to be “a handsome individual bank building.” Architect Henry O. Chapman, of Barney & Chapman, was given the commission and on May 21, 1921 newspaper reported on his designs. “The building will be in the style of the late English Renaissance, the exterior of limestone, with Knoxville marble entrance and base. The plans are designed to give the maximum of light and air and in every way to conform to modern standards of bank architecture. The expected cost of the building was placed at $600,000—about $6 million in today’s dollars. Chapman’s resultant building, completed in 1922, was a critical success. The dazzling white neo-Classical façade oozed respectability and tradition—traits the financial institution sought to portray to its potential customers. Ornamentation was reserved to carved panels; shallow, stylized capitals above the two-story pilasters; and a weighty, balustrade parapet above the cornice. Every year since 1907 the Fifth Avenue Association had awarded prizes for the best designs for newly constructed buildings and for the most skillful work in altering existing structures. On November 14, 1922 the Association gathered at the Waldorf-Astoria for its awards dinner, presided over by Will H. Hays. Although Hays had just stepped down as Chairman of the Republican National Committee and was currently the United States Postmaster General, he would become best known as the president of the Motion Picture Producers and Distributors of America. Among the 500 guests waiting to hear the results that year were State Senator James J. Walker, Rear Admiral J. H. Glennon, Chief Magistrate William McAdoo and real estate bigwig Douglas L. Elliman. Interestingly enough, when the first prize was awarded to the new United States Mortgage and Trust Company’s building, newspapers ignored the architect’s name in print. Telegrams of congratulations for the award were received from President Harding, Governor Miller, Governor-elect Smith and Mayor Hylan. By mid-century the award-winning building was home to a Chemical Bank branch which would remain for over four decades. In 1963, as the neighborhood filled with upscale art galleries and pricey retail stores, the Whitney Museum of Art’s newest building opened across the street. In 1974 the two buildings would be unexpectedly connected. Artist Charles Simonds had been busy with a project chronicling the Little People—an extinct race of diminutive nomads who built settlements of unfired clay, sand, fabric and twigs; then abandoned them. The artist constructed approximately 300 such structures, placed outdoors first on window sills along Greene Street, then in the crumbling walls of derelict buildings on the Lower East Side. The little ruins with towers, turrets and battlements mythologized his imagined people. The works caught the eye of the Whitney, and for its Biennial in 1974 commissioned diminutive ruins to be installed on a second story window sill of 940 Madison. Five years later the museum added to the multi-piece work, called Dwellings, when Simonds installed a miniature set of ruins inside the Whitney above a window in the main stairwell. From that vantage point the piece on the former United States Mortgage and Trust is visible. Barely noticeable from the street, the artwork nearly requires binoculars to fully appreciate. Thousands of pedestrians pass by the building daily without ever noticing the arcane work of art. As the 21st century neared the building was owned by Chase Manhattan Bank which operated a branch here. But by now the bank utilized only a small portion of the structure for its branch. Internationally-known English antiques dealer Stair & Company occupied most of the building. Tickets to the exclusive events were not for sale. To gain admittance, patrons traded possessions worth over $10,000 during the course of the evening. These included houses in the Hamptons, seats from the Titanic, and race horse breeding rights. Chase Manhattan’s branch hung on for a few more years and on March 12, 1998 it was the scene of upheaval in the high-tone neighborhood. Two armed men robbed the bank that afternoon, shooting one customer in the leg and “fleeing with an undetermined amount of cash and ruffling an upscale slice of the city dotted by hushed, thickly carpeted shops with buzzers and gates,” as reported by The Times. The bank and the neighborhood would not have to worry about hold-ups for long. In 2002 the building was taken over by V. Bruce Hoeksema, the designer and owner of VBH, the Rome-based firm known for its luxury jewelry and handbags. VBH commissioned New York architects Peter Marino and Stephen Learner to renovate the 10,000 square foot interiors. The former bank space was transformed to a more domestic setting for the showrooms where handbags—some priced at $14,000—were displayed. VBH and its architects retained the gallery-like feeling of the former tenants, however. Modern artwork was hung on the walls and “ethnic home accessories” and furniture, also for sale, decorated the space. VBH took advantage of the high end gallery district and immediately staged an art program, spearheaded by dealer and consultant Mark Fletcher. Henry Chapman’s award-winning bank building is virtually unchanged since its doors opened in 1922. It neo-Classical design has proved equally adept as a home to finance, art and high-end fashion accessories—not to mention tiny nomadic people.